By Mark - Bolivia - 04 Dec/02 - Viewed 2891 times. 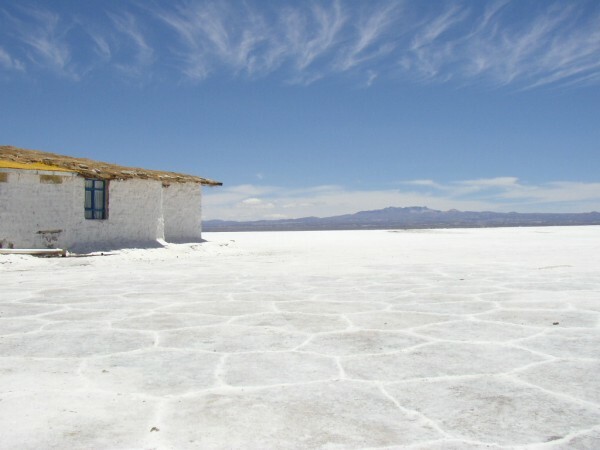 In Uyuni we stayed in Hostal Marith for only B$15.00 each. It is very good value and has a courtyard with washing facilities. As soon as we could, we went to To�ito Tours and organised a four day trip for the next day. It cost us B$527.80 each, but we found out later that the same tour company charged anything between B$527.80 and B$603.20, probably depending on how many people they already had on the tour. We decided on To�ito because it had been recommended for vegetarians and they would fix a price in advance (some of the others you have to pay more if they don't fill the jeep). The price included all transport, accommodation and food for three and a half days. The only thing it doesn't include is water (we took 7 litres each) and the National Park entrance fee. The next morning we went back at 9.30am. We left one of our bags with To�ito and packed all the stuff we would need into the other. We also bought train tickets to Oruro for when we get back (B$30.00 each). We got To�ito to buy them to save queuing. Both guide books and the noticeboard in the train station say that the train leaves at 1.30am on Thursday. To every sane person this means Wednesday night, early Thursday. Not to Bolivian railways - they think 1.30am on Thursday is Thursday night, early Friday morning. There were lots of people we met on the way that had bought tickets and thought they were leaving a day earlier than they were. By 10am we were on the road. There was also another group from To�ito leaving at the same time. Each group is an entirely self sufficient unit, consisting of a Toyoto 4x4, a driver, a cook and six tourists - us, two Germans and two Peruvians in our case. All the food, petrol and water needed is stowed on the roof of the 4x4. First we headed a few km north to Colchani, a small village on the edge of the salt flats. Here we stopped and went to look at a family run salt mining business. A guy showed us round and showed us how they heat up the salt, then grind it and finally an eight year old girl puts it into 1kg packages by hand. They asked for a few Bolivianos donation for the talk. Back in the 4x4 and we headed west out across the salt flats, soon all we could see was pure white salt in all directions. It was incredibly bright. We stopped to take photos and walk on the salt and then continued on. Soon some buildings appeared out of the heat haze. We stopped and it turned out to be a hotel completely made of salt (except the roof). The owner will show you round for B$5.00 each, but we just looked in the window at the salt furniture. Another hour across the salt we stopped for lunch at Isla Pescado. This strange island in the middle of the salt flats is covered in cacti and you can trek to the top of the hill and see across the salt in all directions. It costs B$7.00 each to trek on the island. We also had lunch here, which was a suprisingly good chicken and pasta salad, roast potatoes and vegetables (without the chicken for vegetarians). As we were one of the first groups there we got a picnic table. There were quite a lot of other jeeps arriving and leaving with other groups. I think there must have been at least twenty groups starting out that day. In the busiest month (June) we were told that more than twice as many leave each day. After lunch we started heading south. We saw some people cycling across the salt, which must be very strange as you never feel like you are getting anywhere because there are no landmarks at all. After an hour or so we left the salt behind and wound our way round hills and fields until at 4pm we reached San Juan - the village where we were staying the night. The accommodation is basic in dormitories of six. We walked out to look at the llamas while the cook prepared dinner (soup followed by chicken or vegetable friters, chips and rice). We sat around and practiced our Spanish by talking to the Peruvians. The lights suddenly went out without warning at 9.30pm and we went to bed. Got up at 7am, had breakfast (bread and jam) and left before 8am. We soon crossed a small salt flat and then started climbing through mountains, often there wasn't even a track. The only village we saw had about 20 mud-brick houses and a huge sign colourful sign saying "Welcome to Copacabana". We passed an active volcano in the distance and stopped by some strange shaped rocks. For lunch (avacado or cold meat rolls) we stopped at one of the most beautiful places I have ever seen; a lake full of flamingos, 4600m above sea level. In the afternoon we drove across the Siloli Desert, there were strange red and yellow mountains in the distance. We stopped at a rock formation and saw our first Viscacha. It looks like a rabbit, but with a fox tail and kangaroo legs. The Austrailians in the other group called it a kangaroo-rabbit-fox. A bit further we stopped to look at a petrified tree. At about 3.30pm we arrived at the refuge we were spending the night at. We hadn't seen a settlement since early that morning. It is here that you pay the National Park entrance fee (B$30.00 each). They don't accept dollars here and there is nowhere to change money so bring Bolivianos (the Germans didn't and had to borrow money from us). The refuge is on the west shore of Lake Colorada. This lake has bright red water caused by algae, and multicoloured salt flats surrounding it. There are three types of flamingo here, one of them (the James Flamingo) is very rare. They all looked the same to us though. We walked across the salt flats before dinner (soup followed by spaghetti). The refuge was more basic than the previous one - no running water and electricity only for two hours a night, but they somehow managed to have an internet cafe. Lots of other groups were staying here too, Colque Tours seemed to have at least six 4x4s. We got up at 4.30am and packed by candlelight as there was no electricity. By 5am, all the 4x4s were racing off across the desert south of Lake Colorada. None of them were taking the same route so we could see lots of sets of lights all around us in the darkness but heading in the same general direction. There was low cloud and snow as we climbed up to 5000m. At dawn we reached some geysers, it was snowing and it was surreal seeing the hot steam rushing up from craters. An hour later we stopped at some hot springs for breakfast (bread, jam and something made of eggs). Not many people were getting in because it was so cold, but we did and we glad we had as it was lovely and warm in the water. Getting out was a bit of a problem though. About 11am we drove down a huge red valley covered in rocks, it was like driving on the surface of Mars. At the bottom of the valley was Laguna Verde - the end of our journey south. It is right on the Chilean border and it is here that people crossing to Chile leave the tour. The lake changes colour depending on weather conditions - it was green today because it was windy. From here, it is 350km back to Uyuni with not much to see on the way back. We set off back the way we had came to Lake Colorada and passed it on the east side. Some way further we stopped for lunch (avocado or tuna rolls with watermelon) near a salt flat where people were mining salt. It looked a bigger and more professional enterprise than the one we had seen on the first day. Three more hours driving took us to the Valley of the Rocks, some strange rock formations where there were more kangaroo-rabbit-foxes. Another thirty minutes and we were in Alota, a small village where we stayed the night. There was no running water or mains electricity. Dinner (soup followed by a cuban dish containing cheese and vegetables) was in the local shop. Left at 8am and drove for four hours back to Uyuni. Half way back we stopped at San Cristobal. This village used to be up in the mountains, but a North American mining company wanted to mine there so they bought the whole mountain and moved the village. It does mean that this village is the most modern and well built in the area and has a very unusual church (also built by the mining company). Just outside Uyuni we stopped in a train cemetary where trains from 1907-1960 have been left to rust. It was really good as you could climb all over the trains but Laura got bored long before I did. We had lunch here (cheese rolls followed by tinned peaches) before driving back to Uyuni about 1.30pm. All in all this was the best B$527.80 I have ever spent and we saw some of the most amazing and varied scenary. The meals were pretty good considering they had to take everything with them. Due to the train timetable fiasco we have a day to kill in Uyuni before heading to Oruro and La Paz. To�ito Tours, the tour company we used. We would recommend them, especially for the food.